ITC desktop publishing and graphic design resources can help you get the smart and impressive design you want. You can make use of our desktop publishing and graphic design services as part of your larger language services project, or on its own. Although desktop publishing may be one of the last steps in a translation project, the overall look of a document or presentation is one of the first things that gets noticed. It drives the overall impression of how your company is viewed in the marketplace. You can benefit from ITC’s many years of experience in the translation industry. Our graphics team knows the nuances of design and linguistic expectations in differing cultures and target markets. Our desktop publishing team has learned that each market has its own unique challenges – and will help you navigate your market. We can design your translation using the existing layout, or create a new design. Either way, we will design it so your layout will look like it was created in the target country. Venturing into a new market? We can give you advice on your desktop publishing and graphic design decisions. After all, we provide translation in over 200 languages. 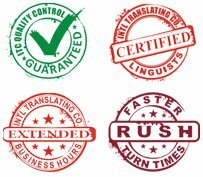 You need your translations to be published with the utmost quality and precision. Even a minor error can diminish your brand or product image. At ITC, we are precise with the details of your project: context, spelling, special characters, mechanics, word usage, hyphenation rules, appropriate style, and sentence formations.